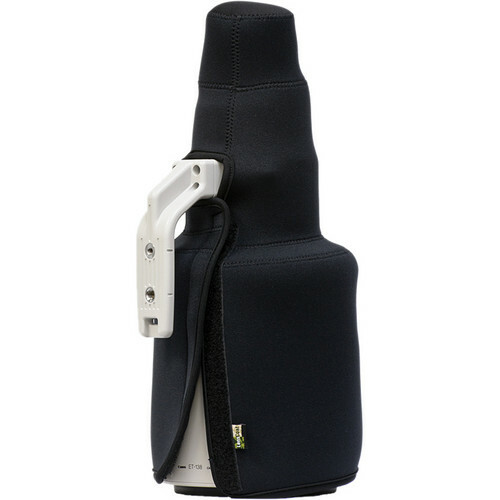 The black TravelCoat for the Canon 500mm f/4 IS II Lens from LensCoat is a 3.0mm thick shock-absorbing closed-cell neoprene lens cover that is custom tailored to fit the lens with its lens hood mounted in reverse position. It is designed to fully protect the lens from bumps, scratches and abrasions when not in use, without the need of a more traditional bulky lens case. The trim fit of the coat permits you to have extra storage space when you're packing for that long photo excursion - or even a day trip. The coat simply slides over the lens, and closes with a secure touch fastener. The black TravelCoat renders the lens dark when shooting in low light scenarios Use with the appropriate optional Hoodie for complete lens protection. Box Dimensions (LxWxH) 22.9 x 3.1 x 2.3"
TravelCoat for the Canon 500mm f/4 IS II Lens (Black) is rated 5.0 out of 5 by 3. Rated 5 out of 5 by Sharkdiver from Travelcoat This is for my 500mmf/4 Canon Lens, and it fits perfectly. Even with my lens hood on it. I like that I can protect my lens better, especially when traveling, it's light weight,, and easy to put on and off. Rated 5 out of 5 by Beth from not what i needed This may be a good product I do like other products from this company. I am returning it because I can't use it. Rated 5 out of 5 by David from Great protection Allowed me to properly protect my 500/4 II while giving my more space in my carry-on.